98 • RV PRO • September 2018 rv-pro.com D E A L E R S brands from companies that stand behind their products. "Grand Design, Forest River, Winnebago, and Keystone are mainstays," he says. "I have access to 40 different brands. We essentially are the candy store of campers." 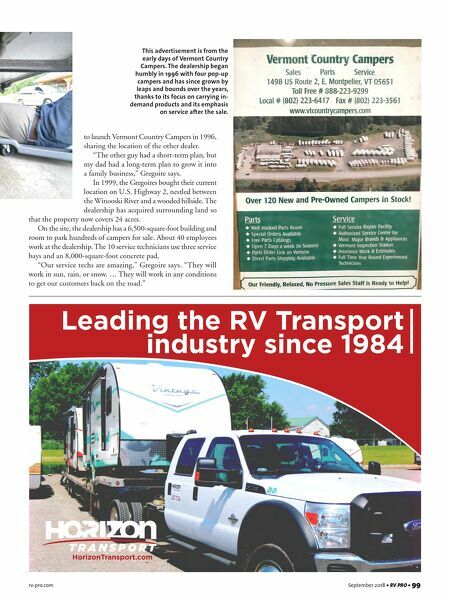 As a result of its wide selection of products and online sales presence, Gregoire says Vermont Country Campers attracts customers from far beyond the New England area. "I had a gentleman who bought from us in California. He made it a road trip with his family," he says. "He picked up his motorhome and drove back home to California." Gregoire says Vermont Country Campers passed $22 million in sales last year and sold more than 800 units two years in a row. "We went from 600 (in 2015) to 801 to 831, and we're on track to surpass 800 again this year," he says. From Humble Beginnings Vermont Country Campers success is all the more remark- able considering its humble beginnings in 1996. Gregoire tells the story of his father's entrance into the RV industry: "He started with $8,800 and four pop-ups. He was selling them on the lawn of my godfather's house," he says. "He'd literally have them on the front lawn." Actually, Layne Gregoire's origins in the industry date even further back, working at an RV dealership as a young man in the 1980s, his son says. "He fell in love with the camping industry. He saw the hap- piness that people had when they got their campers," Logan Gregoire says. "But he did not like the way customers were treated after the sale. He thought he could do it better." After more than a decade as a traveling salesman in another industry, Layne Gregoire began talking seriously with a dealer who was hoping to transition out of the business. But Layne and his wife didn't have the money to buy into the dealership. "They saved for a year," Logan Gregoire says. "It was the American story of eating noodles and getting together with friends to see what they had in the freezer." After a year of scrimping and putting away money from Layne's earnings and Cindy's pay as a teacher, they were ready Above: Service techs Roger Ewan (left) and Gary Charbonneau troubleshoot a malfunctioning slider mechanism. Left: Three members of the service department hoist a new air conditioner to the roof of a Winnebago motorhome, which a couple traveling from Arizona stopped into the dealership to fix.